Does Apple Track You On Your iPhone? Here's The Truth! You are at:Home»iPhone»Security»Does Apple Track You On Your iPhone? Here’s The Truth! As an Apple user, there’s a constant feeling in the back of your mind that you’re being watched. You’re suspicious that the Cupertino giant is keeping an eye on your location wherever you go. 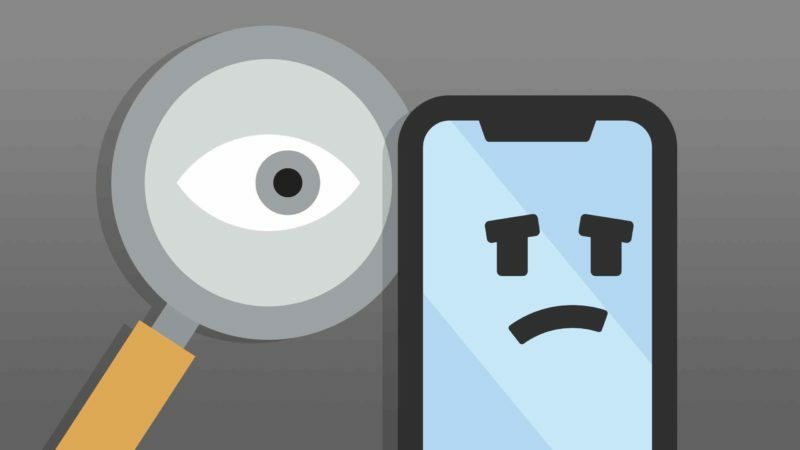 In this article, I’ll explain how Apple tracks you and help you turn off features that can track your location on your iPhone! 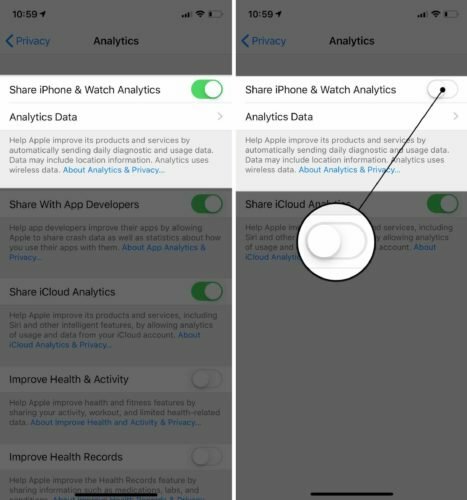 When turned on, iPhone analytics will send daily diagnostic and usage data to Apple. Apple says it uses this data to improve their products and services. Things get a little more interesting when you read the fine print. Apple states that none of the data collected “identifies you personally”, but this seems a bit misleading. What happens if those systems get hacked or fail completely? Would your personal data then be exposed? The Marriott, Facebook, MyFitnessPal, and many other large companies have recently had their data breached. Healthy skepticism of any data collection is completely understandable in today’s climate. 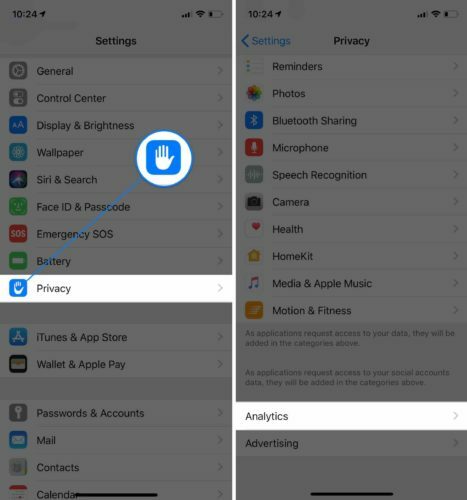 Open Settings and tap Privacy. Next, scroll all the way down and tap Analytics. You’ll see a switch at the top of the screen next to Share iPhone Analytics. If the switch is green, you’re currently sending your diagnostics and usage data to Apple. Tap the switch to turn off iPhone analytics! Note: If you have an Apple Watch paired with this iPhone, it will say Share iPhone & Watch Analytics. It uses cellular data to send reports if Wi-Fi isn’t available. You’re essentially paying to have Apple collect your usage and diagnostics data when you send reports using cellular data. It can drain your iPhone’s battery life by constantly sending usage and diagnostics reports to Apple. That’s why “Turn Off iPhone Analytics” is one of top iPhone battery tips! iCloud Analytics collects small bits of information on your iPhone, including text from your text messages and emails. This allows Apple to improve services such as Siri by making it more intelligent. For example, you may receive personalized suggestions when asking Siri where you should get dinner tonight. However, iCloud Analytics is one of the many tools that allows Apple to gain an insight into who you are. Naturally, there are a large number of users who are uncomfortable with it. Open Settings and tap Privacy -> Analytics. 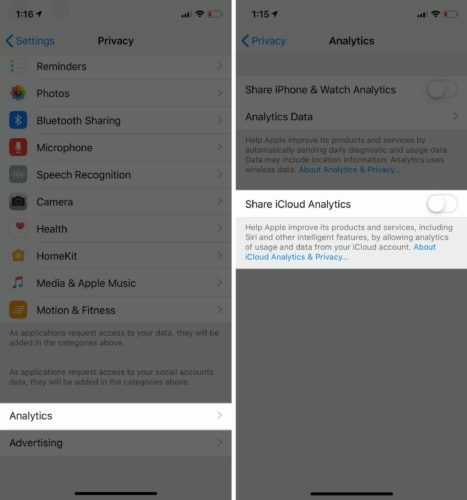 Then, tap the switch next to Share iCloud Analytics. You’ll know iCloud Analytics is off when the switch is gray. Location Services uses GPS, Bluetooth, Wi-Fi hotspots, and nearby cell towers to track your location while you’re using certain apps. Location Services is a useful feature for certain apps, like Google Maps and Lyft. 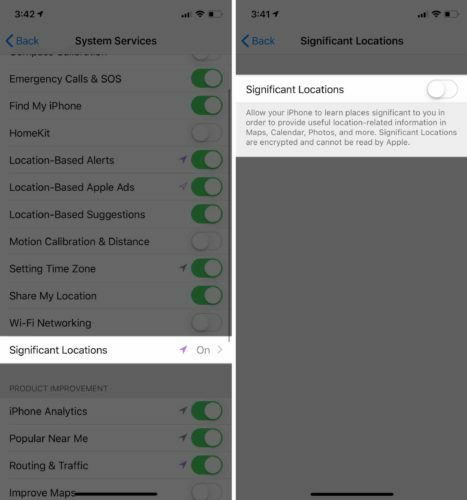 iPhone users have been able to customize their Locations Services settings for a long time. You have the ability to set permissions for individual apps, which helps you prevent certain apps from having access to your location at all times. However, you probably don’t want to turn off Location Services for every app. For example, you’ll probably want to keep Location Services on for Uber so your driver knows where to pick you up! 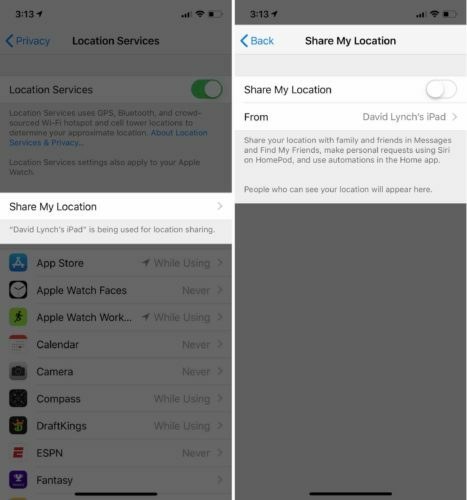 Open Settings and tap Privacy -> Location Services. 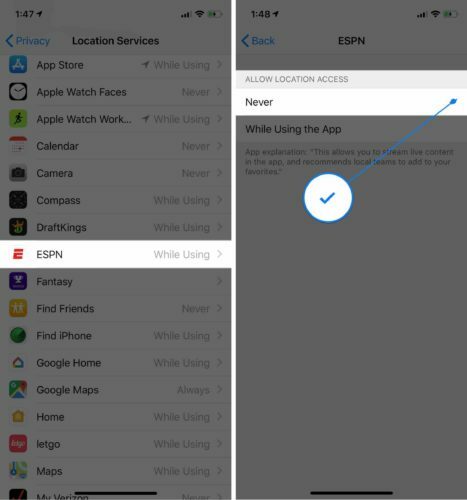 Scroll down your list of apps and determine which ones you want to have access to your location. Tap on an app you want to turn off Location Services for. Tap Never to turn off Location Services for the app. You’ll know Never has been selected when a blue checkmark appears to its right. While Location Services shares your location with apps, Share My Location lets friends and family members know where you are. It’s used predominantly in the Messages and Find My Friends apps. It’s a useful tool if you have wayward children, elderly parents, or a significant other. Personally, Share My Location is a feature that I’ve never used. I don’t know anyone who does use it. Considering that it’s another way Apple can track your location, I decided to turn it off on my iPhone. 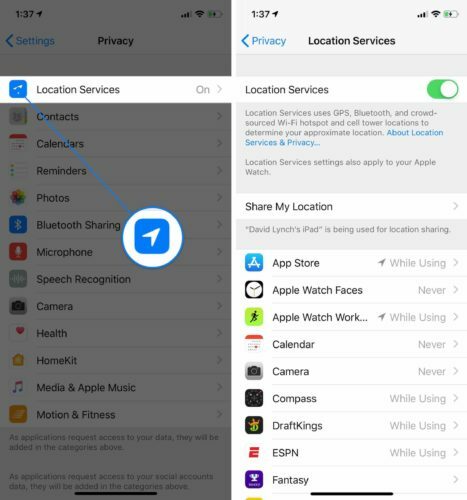 Open Settings and tap Privacy -> Location Services. Then, tap Share My Location. Tap the switch at the top of the screen to turn off Share My Location. You’ll know this feature has been turned off when the switch is gray. In my opinion, the most alarming location-tracking feature on iPhones is Significant Locations. Not only is this feature tracking your location, it’s keeping track of the places you visit most often. This could be your home, your office, or your best friend’s house. If you go to Settings -> Privacy -> Location Services -> System Services -> Significant Locations, you’ll see a convenient list of places you go to most often and the dates you were there. Spooky, right? I had more than a dozen places saved on my list of Significant Locations. Apple says this data is “encrypted” and that they can’t read it. However, you don’t want this data falling into wrong hands, even if there’s a very small chance of that ever happening. Tap the switch at the top of the screen to turn off Significant Locations. You’ll know it’s off when the switch is positioned to the left and gray. Surfing the web on your iPhone can be just as hazardous as it is on a laptop or desktop computer. Not only does your ISP know what sites you visit and how often you visit them, but Google and other advertising companies can see what you do and deliver ads based on your interests. Fortunately, Apple takes online privacy seriously and has provided a way to prevent websites from collecting your data. 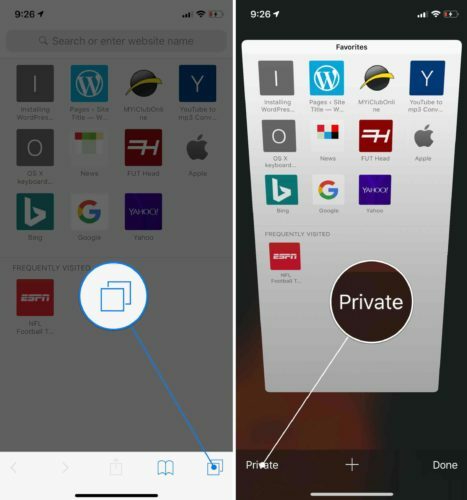 One way you can prevent websites from collecting your search history and other data is to use a private browsing window. Tap the overlapping squares button in the bottom right-hand corner of the screen. Tap Private in the bottom left-hand corner of the screen. Tap Done. You’re now using a private Safari browser! Tap the three horizontal dots button in the lower right-hand corner of the screen. 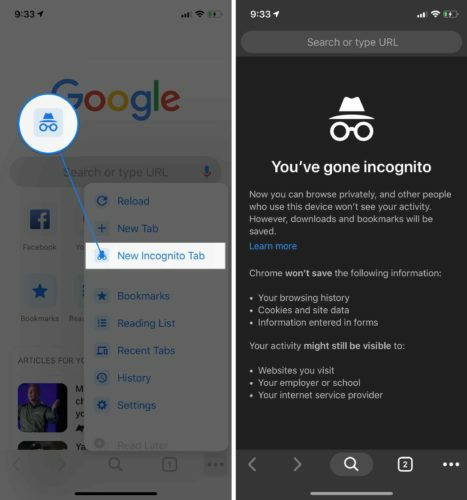 Tap New Incognito Tab. You’re now using a private Google Chrome browser! There’s even more you can do if you’re worried about how Apple tracks you online. 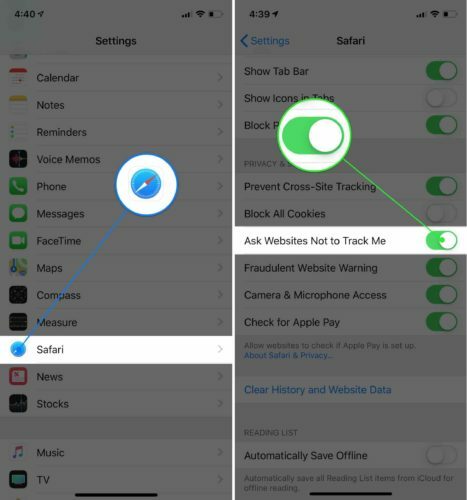 You can try and prevent third-party advertisers and other companies from tracking you online by turning on “Ask Websites Not to Track Me” in the iPhone Settings app. Before I show you how to turn this features on, it’s important to note that websites are not legally obligated to grant your request for privacy. In the past, companies like Google and Facebook have completely ignored similar requests. While your requests may be fruitless, I do recommend turning this feature on. At the very least, you’ll prevent honest companies from tracking your activity online. Open Settings and tap Safari. Then, scroll down to Privacy & Security. Finally, turn on the switch next to Ask Websites Not to Track Me. You’ll know it’s on when it’s green! 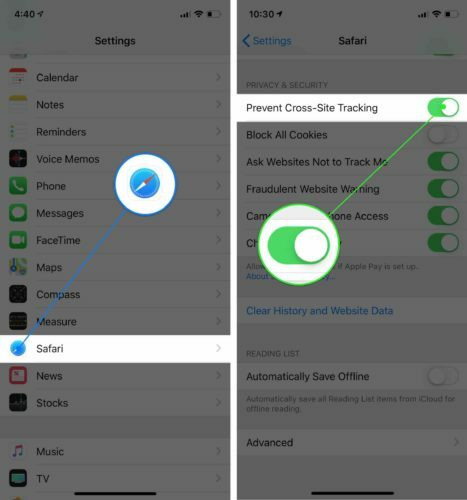 While you’re here, make sure the switch next to Prevent Cross-Site Tracking is turned on. This will help prevent third-party content providers from tracking you across multiple websites. When you turn this setting on, the data a third-party content provider collected about you will be periodically deleted. However, the tracking data won’t always be deleted if you visit that third-party content provider directly. Think of these third-party content providers like bees. If you don’t bother or interact with them, they won’t bother you! Now that you know more about how Apple tracks you, your data and personal information are safer than ever! Make sure to share this article on social media to help your family and friends maintain privacy on their iPhones. Feel free to leave any other thoughts or comments you have down below. Previous ArticleiPhone Not Making Calls? Here’s Why & The Fix! Next Article TikTok Not Working On iPhone? Here’s The Fix!